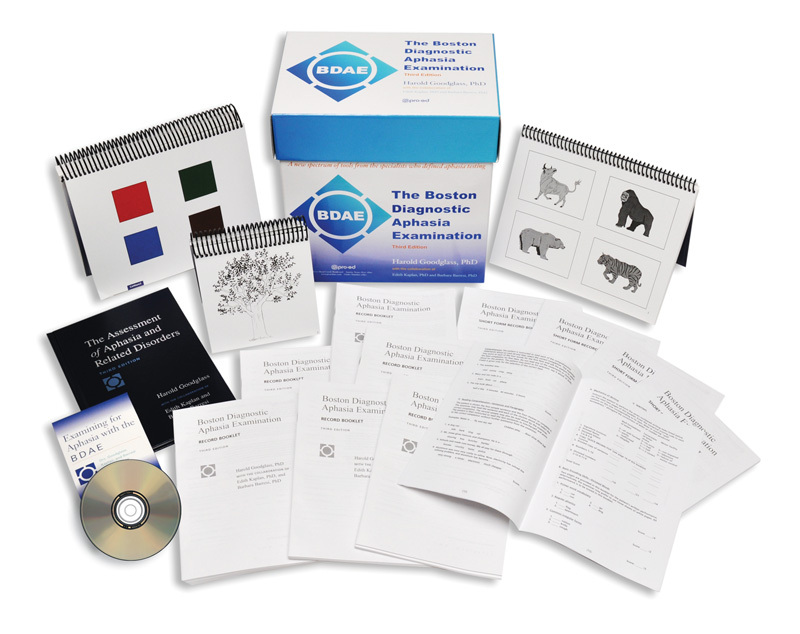 BDAE-3: Boston Diagnostic Aphasia Examination–Third Edition KIT Harold Goodglass • Edith Kaplan • Barbara Barresi : LinguiSystems, Inc. This spectrum of tools helps you identify and distinguish among disorders of language function and neurologically recognized aphasic syndromes. Boston Naming Test–Second EditionThis 60-item test helps you determine the extent of your client's visual confrontation naming abilities. A 15-item short form and a multiple-choice version of the test can be used to retest comprehension of any words missed on the confrontation naming exercise. Boston Diagnostic Aphasia Examination Stimulus Cardstandard Form (146 illustrations) and Short Form (27 illustrations). The two versions of the BDAE give you the options to perform extended testing or a brief, no-frills assessment. Record BookletsThese handy, portable booklets correspond to each assessment: the BDAE standard form, the BDAE short form, and the Boston Naming Test. They provide you with everything you need to administer the test, including instructions, spaces and grids for entering your client's responses and errors, and scoring scales to help you interpret the results. DVDIn this DVD, Examining for Aphasia with the BDAE, Drs. Goodglass, Kaplan, and Barresi demonstrate the test materials, examiner/patient interactions, and scoring techniques through real-life examinations of three aphasic patients.